Emma and Andy met while working at the Worth Valley Railway with the vintage steam trains and diesel engines, so it was only fitting that their wedding day followed with the vintage transport theme. 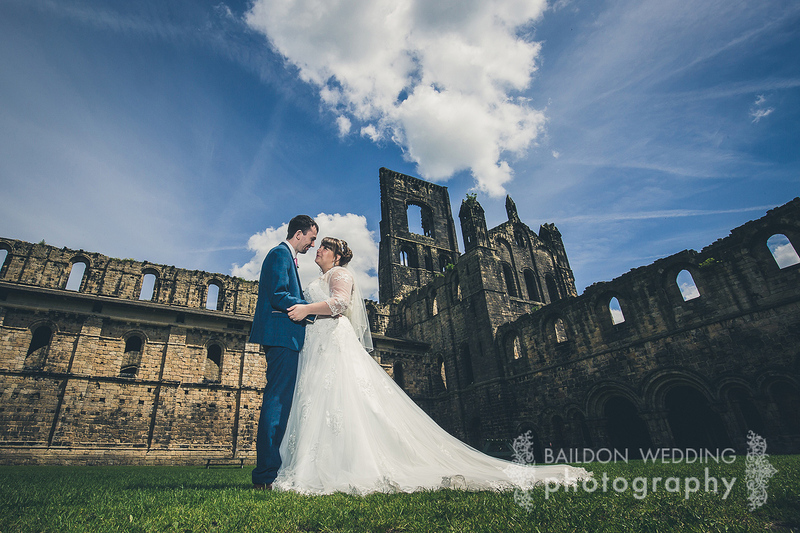 Involving a magical mystery tour to their Leeds wedding venue and Kirkstall Abbey wedding photo backdrop. My journey began at Bradford Forster Square train station, where I embarked the bus journey along with many of the guests by the vintage Leeds Daimler double-decker bus from Yesteryear Vintage Vehicle hire. Andy and their son Tom were already aboard as we made our way to Leeds. We soon arrived at the opulent Leeds Marriott city centre hotel, where Emma was getting ready, and I got to peek at their beautifully themed decor before the wedding ceremony in the Thomas Ambler Suite. The ceremony room was decorated with big round balloons and lit with colourful uplighters. After the ceremony, the bride and groom were showered with confetti from their guests before the magical mystery tour began! When I first met Emma and Andy, they had said that the bus journey was a big part of their wedding day, and as they were getting married in Leeds city centre, they wanted to make full use of the bus to take the guests to Kirkstall Abbey for photographs. We were met with glorious sunshine for their guests to enjoy, while the happy couple had their couple pictures amongst the 12th-century abbey ruins. After some group shots, we returned to the Leeds City Centre Marriott for the speeches and wedding breakfast. First up was Emma’s wonderful mum, followed by Andy, Emma and the two Best Men. Andy’s brothers were his Best Men and aimed to embarrass him thoroughly after the previous charming speeches. The cake was spectacular, in the six years I have been photographing weddings, I have never seen a wedding cake quite as crazy and unusual. Emma had tasked Andy with driving to London to collect the cake a couple of days before the wedding from a supplier called Fondant Fox, decorated with rainbow meringues from Meringue Girls. He managed to drive it home to Yorkshire in perfect condition! Emma and Andy’s friends designed the transport-themed name places and invites, while Emma added some handmade touches for the tables and quirky luggage tag table plan. It was an absolute pleasure to meet Emma and Andy and be able to capture their big day. They have so much love for each other and surround themselves with a fantastic group of people. Combination is great and full of fun. the shoot is stunning!